In Japan, you can find anything and everything in miniature. Isn't this car cute? Don't you just love its tapered profile? What about the jaunty way its steering wheel sits front and center? And it only needs one windshield wiper! Not to mention the ambidextrous doors -- also a pretty cool feature. I have seen a few of these vehicles parked around town but I have yet to see one in motion. Egg Dog? Though I can't put my finger on it, there is something off-putting about this new product. It appears to be egg salad in a bun but I can not say for sure. From a design point of view, the three-sided wrapping could be a tidy solution to the messy problem of filling leakage. Perhaps this shape lends itself more easily to mass-production than the usual sliced bread. Quietly, I will admit the Egg Dog is kind of cute in a quaint, clam roll sort of way. Yet, conceptually, there is something distasteful about the implicit cross species eating. According to a certain religion, even benign-seeming hybrids like nectarines and plucots are verboten. Not that this sandwich-wannabe would be any more appetizing if dogs laid eggs. It also didn't help that its convenience store display was not refrigerated. Doubt this one will be a big seller. The other day my friend and I chanced upon an exhibit in the Spiral Building of accessory prototypes designed and made in Tokyo's Taito Ward. Apparently, Taito-ku is a hotbed of creativity. Or wants to be. The first item on display, a pair of high-heeled, pink lace-ups with frilly, fabric skirts encircling the toes, floored us. Kind of Wicked Witch of the West meets Little Bo-Peep. Absolutely ridiculous. Yet charming at the same time. Our attention was then lured away by a second set of shoes. 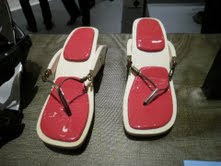 Sandal-like and slightly more practical, this pair seemed to be fashioned after folding beach chairs. Made mostly of wood, they did not look particularly comfortable. But they might function nicely as sushi serving pieces. Would that Eve had been with us. My favorite item of all was the purse shaped like a taco. You can see it in the photo above, next to the man-bag resembling a baseball mitt. I am only speculating that Mexican food inspired this design. But on close inspection you will notice that it is made of tortilla-shaped, leather layers that fold and snap together at the top. Composed of two sheets, each layer is actually a flat pouch. Oh, how I love a purse with compartments. 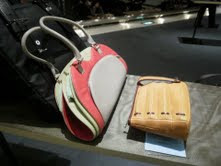 Yet the bag's coolest feature by far was the open space sandwiched in the middle -- the ideal place to stow the NYT. Japan certainly has a way with voids. Now for my critique. The bag's designer, an elfin 32-year-old whose portrait hung on the wall nearby, ought to reconsider her color scheme. Does beige really go with everything or nothing at all? And the hardware was a little too Burlington Coat Factory for my taste. But those are cosmetic concerns. If she plays her cards right, this product could have a rosy future on the shelves of some swish boutique. While I did not share these comments with the exhibit organizers, we did complete written surveys which awarded each of us a spin on the lucky draw machine. A bittersweet ending, we both missed out on the big prizes but won little packets of chocolates tastefully adorned with brown ribbon. 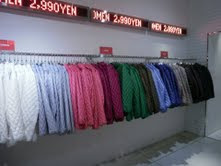 Yesterday I had the pleasure of introducing a new pal to UT, the uber hip Uniqlo spin off shop just above Harajuku. Though UT carries some Uniqlo standbys, the shop's big draw are its limited edition tee shirts earmarked for teenagers and 20-somethings. At the moment the store is featuring a series of tops designed with Disney (can't wait till that sells out) and phasing in a new collection authored in collaboration with Crystal Ball whose parent company, Garcia Marquez, produces the must-have, printed plastic bags adorned with rick-rack. I can live without these too. UT's rainbow line up of down jackets did, however, stop me in my tracks. A modest Y2900 apiece, they were hard to resist. Like my mother, I do have a bit of a weakness for jackets. But I only gave fleeting thought to ownership. What drew my eye like a magnet was the garments' clever and attractive presentation (the picture doesn't really do it justice). I just love the movie theater marquee above and the spectral display below. Maybe I should organize my closet by color too. This time of year I often look up and marvel at the brilliant foliage of Japan's ubiquitous maple trees. 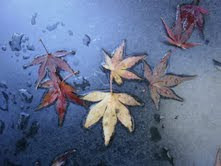 But the other day I looked down and saw their delicate leaves in an entirely new light. Splayed on the pavement, secured in place by rainwater that drenched the city the previous night, the leaves were no longer bright red and fiery orange. Many were now rimmed with brown or, perhaps, even further along in the decay process. Others revealed their silvery undersides. What grabbed me was their star-shaped profiles. In a group, the identity of the individual leaf gets lost. And, earlier in the season, when the trees were ablaze with color, the robust hues practically eclipsed the leaves' delicate forms. Unless you looked close. (For this express purpose, I sometimes stand underneath a leaf-laden bough and look skyward since the sun's natural, back-lighting brings the lacy perimeter of each frond into focus.) Though new and interesting, my observation of the maple leaf's astral outline did not really seem blogworthy. Plus I didn't want to bore you with too much tree talk. Then something happened that caused me to change my mind. A little further on, I practically stepped on a lost earring lying directly in my path. 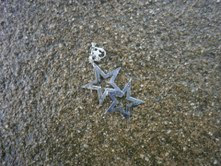 Just like the leaves, it was star-shaped! Composed of two dangling, silver-colored, five-pointers, it was neither the product of a design-genius nor made of precious metal. But this uncanny alignment of the proverbial stars was surely a sign of some sort. Don't you agree??? We ended our trek at the apple orchard just a few hundred feet from our house. 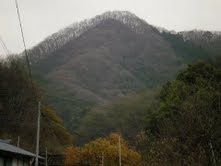 We loaded up on apples (5 kilos of Fujis) and a bag of frozen chestnuts, rice-cooker ready. As "service" for our purchase, we received three, yellow-skinned Ourin apples. Pippi and I shared one as soon as we got home. On my recent trip to Taiwan, my guide thought I ought to see a little bit of her home country. Since I am an architect, I asked her to show me interesting buildings. We visited two: the brick home built by an English merchant and a combination Buddhist-Daoist temple. To get to the temple, we had to take a 10 minute ferry ride and then walk a short distance up from the port. The area was very congested and teaming with activity. The main thoroughfare was edged with a mixture of shops selling clothes, food stuffs or souvenirs and seafood restaurants whose freshly caught menu stared out at us from ice-filled cases. Breathing status unclear. Motor bikes, cars and foot traffic took over the center of the street. A riot of color, sounds and smells, the sun-baked scene was thoroughly captivating. And completely overwhelming. 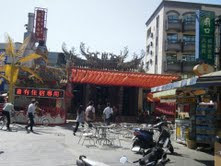 Angled towards the street, the temple was tucked away, off to the side, where it was slightly removed from the fracas. Every surface of the single-story building was covered with relief and tiny sculptures, each one more brightly painted than its neighbors. 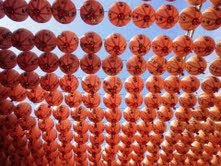 Next to this, the canopy of red, paper lanterns strung up in front of the temple had a remarkably calming effect. Maybe it was their uniform color. Maybe it was the way they seemed to float effortlessly, bobbing slightly in the breeze. Maybe it was the way they muted the sun's scorching rays. Maybe I just like grids. Once my eyes adjusted to the interior's semi-darkness, the main sanctuary's golden statuary and piles of offerings (bundles of fake money ready for burning) came into view. The clattering of wood blocks falling on the floor startled me. Had I knocked something over? No. At the very back of the temple, facing an awe-inspiring group of gods, stood the main altar. On top of the altar were several pairs of kidney-shaped, wooden blocks. We surreptitiously watched a woman pick up a pair of blocks and drop them repeatedly on the floor as if her life depended on it. And maybe it did. If both blocks landed face up or face down, she had to keep trying. 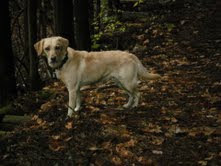 But if one faced up and the other one down she could proceed to the next step and choose a stick from a basket nearby. The stick, in turn, had a marking on it and the marking corresponded to a poem which was then subject to interpretation by the temple expert. By the time we finished our tour, she was leafing through the book, looking for her poem, hoping it would have the answer she determinedly sought.